← These Boots Caught a Man! Gosh Connie and Russell, This reminds me when we lived in Goshen, Arkansas. – – – Been There, Done That. 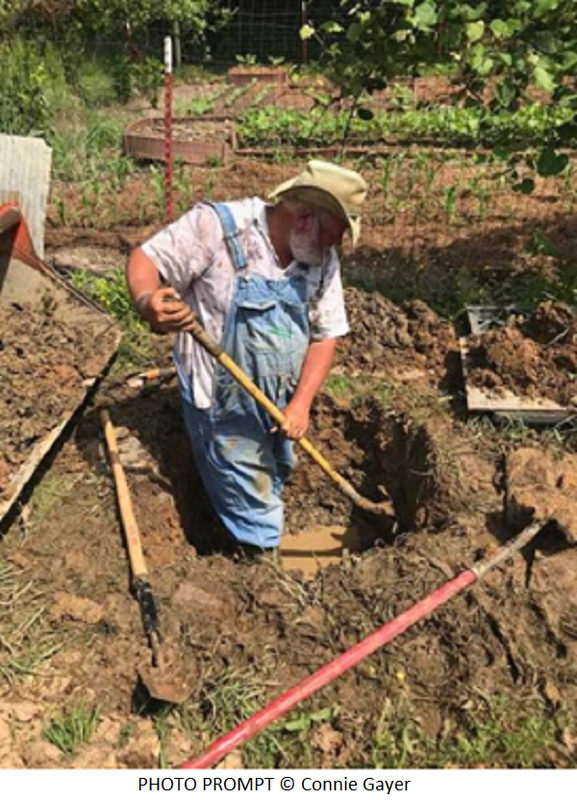 By the way, as soon as I saw the photo without even seeing who submitted it, I knew exact who it was on the end of the shovel, ha. Thank you Mike, We both thought it was a funny picture. Thanks for stopping by. Thank you Rochelle. I love the picture and Mike and I had a good laugh about Rusty’s choice of profession. Who me . . . grumble? Never! So funny. I can see why the yard man is grumpy. I can see with the rapid weightless that there’s going to be a lot to dig through to find those rings. I guess the lovely Contessa was doing the paperwork when the gold rings slid from her prim and proper fingers. Oh the things a poor yardman will do for his lady.